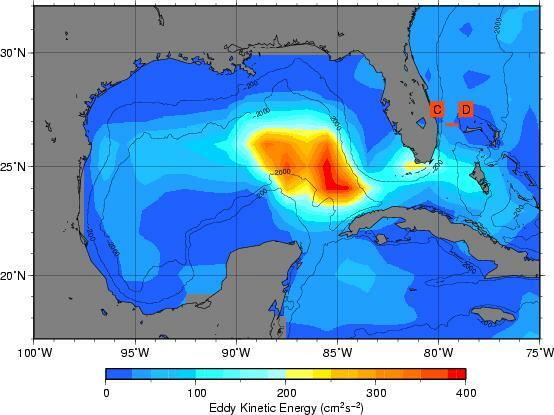 The mean meridional eddy kinetic energy over the Gulf of Mexico and the Florida Straits between November 1992 and December 2004. The geostrophic transport time-series is estimated across 27°N for the Florida Current (red line). The 200m and 2000m bathymetry contours are superimposed. 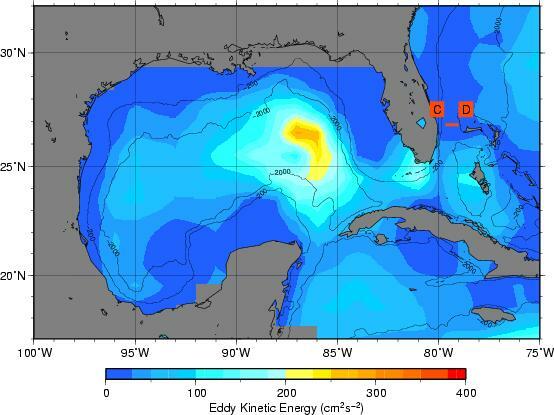 The mean zonal eddy kinetic energy over the Gulf of Mexico and the Florida Straits between November 1992 and December 2004. The geostrophic transport time-series is estimated across 27°N for the Florida Current (red line). The 200m and 2000m bathymetry contours are superimposed.